The attacks were carried out "by armed men, many in uniform," near the northern city of Bentiu, according to a joint statement signed Monday by UNICEF chief Henrietta Fore, Mark Lowcock, the U.N.'s undersecretary-general for humanitarian affairs, and U.N. Population Fund Director Natalia Kanem. The trio called on all "relevant authorities to publicly denounce the attacks and ensure those responsible for these crimes face justice." But the agencies say the actual number of cases is "far higher," as gender-based violence is severely under-reported. 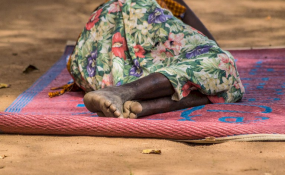 The horrific cases of sexual violence are among the many atrocities reported in South Sudan since the world's youngest nation erupted into civil war after achieving independence in 2011, triggered by a power struggle between President Salva Kiir and his then-vice president, Riek Machar.